"There's a time for everything," Bernd says to himself with a sigh. And the same goes for him, the notice board on the ground floor of Building 7. Bernd the Board has come to know them all very well, the posters. Brigitte, the spontaneous poster, who slapped a notice onto the board every now and again, sometimes right on top of other posts, sometimes scribbled on the back of an old movie ticket. Jörg, the über-accurate poster, who pinned his notices on the board so precisely and perfectly positioned in line with the other posts that it could've been measured with a ruler. Or Mr. Meyer, the traditional manager. When he walked past he would take a moment to tidy Bernd the Board a little. Moving notices around, taking old ones down and arranging them so that nobody could possibly miss that one notice that needs to stay on top for everyone to see. The mishmash of private messages and company announcements had always annoyed him. And of course Bernd the Board knew all of the readers too. Anita, who always had to rummage around in her bag to find her glasses. Bodo, who pointed to each card with his finger as he read it. Christiane, who was usually in a rush and sometimes even took a photo of the whole board so that she could take a closer look later. Plenty of people have stood in front of Bernd the Board and discussed the different notices hanging there. "That one sounds interesting, are you planning to go?" "Do you know that guy?" "Look, haha, have you seen this?" "Well, I wouldn't have put it like that, should I just add my two cents to this notice?" Ahh, the good old days. It was a little chaotic, but it had its charm, and it was productive. Bernd the Board helped to organize joint ski trips on long weekends, found buyers for concert tickets, brought people together to start small social projects and a whole lot more. And not to forget the mandatory notices such as safety information – did anyone even read those? Or the notes posted by the employee representative group? The management announcements that Mr. Meyer posted? You can't count how many people have seen a physical notice and people can't leave feedback about them either. You have no idea who has seen what, or what actually grabbed their attention. But these questions are no longer relevant. For there were some who saw the board of notices as anything but "charming and productive" – especially the "productive" part. Bernd had heard it more and more often in recent times: It's all well and good (even if it is confusing and unstructured) – but only a fraction of the people in the company even see the things they're supposed to see. This is just a small part of the company. There are plenty of other hallways, canteens and cafeterias all spread across the various buildings. And there's even a large number of employees from this department that never come anywhere near this particular notice board. The manager Mr. Meyer wasn't too worried about the private notices but the essential mandatory information that had to be displayed always concerned him – company invitations or employee rep announcements, for example. Bernd had picked all of this up from conversations that took place right in front of him. And Bernd had heard rumors that things were quite different in other parts of the company. The notice boards there were closed away behind glass, and if someone wanted to post something they had to first go through the official channels to get a key. They might be nice and tidy (because there's hardly anything on it), but they're also rather quite boring and rarely up-to-date. Eventually, something had to happen, something radical, some kind of far-reaching decision. At first, it slowly crept up, but it's now come to the point that Bernd the Board can no longer ignore it. There are fewer and fewer notices – not only the private ones posted by employees, but also the official department announcements and company information. And some people who he otherwise saw regularly standing before him and reading the notices, simply walk past now. Anita with her reading glasses, or the Bodo and his reading finger, and even Christiane hasn't taken a photo for months. Neither Brigitte nor Jörg have posted anything new over the past few weeks, and hardly anyone else has either for that matter. Recently Mr. Meyer took a radical step: One day he stood in front of Bernd, flew over a few notices, and then with a look of determination, started plucking notices off one after the other – one, two, three – until they were all gone. Then he posted one single A4 page. "You can find all current news and announcements on our intranet. You can access it via our mobile app, the touch displays around the company buildings or in the browser on your work computer. Feel free to use a relevant topic in the intranet community to post anything you want to share. Questions? The training team is happy to help you with anything relating to our intranet!" Since then Bernd the Board has been leading a sad existence – abandoned and barely acknowledged. So there's this new thing called a Linchpin intranet. Bernd had heard some details from people passing by. Apparently, they've declared war on emails and out-dated artifacts like paper notices. Out-dated artifacts! Bernd resents the very thought! What an outrage! One time, two members stopped close to Bernd and started looking at a smartphone. They can even access the intranet on one of those things! And somewhere close by – to be more precise in the corner of the building's entry hall – there is even a kind of digital notice board. A large monitor with a touchscreen, where you can not only see the contents of the intranet, but interact with it and use all of the different functions. A touchscreen! Wow, finger-pointing Bodo will be in his element! Mr. Meyer and his manager friends on the board can now communicate company information and news to so many more employees – and that with a lot less work. The same goes for corporate communications, the employee representatives, internal organizations, IT and lots of other teams, all of whom want to share their content with their colleagues. They can even communicate news to specific user groups without sending it to others who wouldn't find it relevant. Personalization – a term that is only topped by "digital workplace" and "collaboration" on Bernd's personal list of evil words. But nobody thinks to ask him. Employees who were rarely seen anywhere near Bernd in the past now see all of the most important news as soon as they get to the office and open the intranet in their browser. Or on their smartphone, where they can choose to receive notifications when news is posted that is relevant to them. Or on things like the digital notice board (touchscreen) around the corner. But what about the private content employees used to post on Bernd the Board too? The search for other ski fans for a long weekend in the mountains, for volunteers for a local charity project, or for someone to take some concert tickets off their hands? Of course, it's all on the intranet now. There is even a separate topic for personal notices on the integrated microblog: They call it the "Community Space" here. 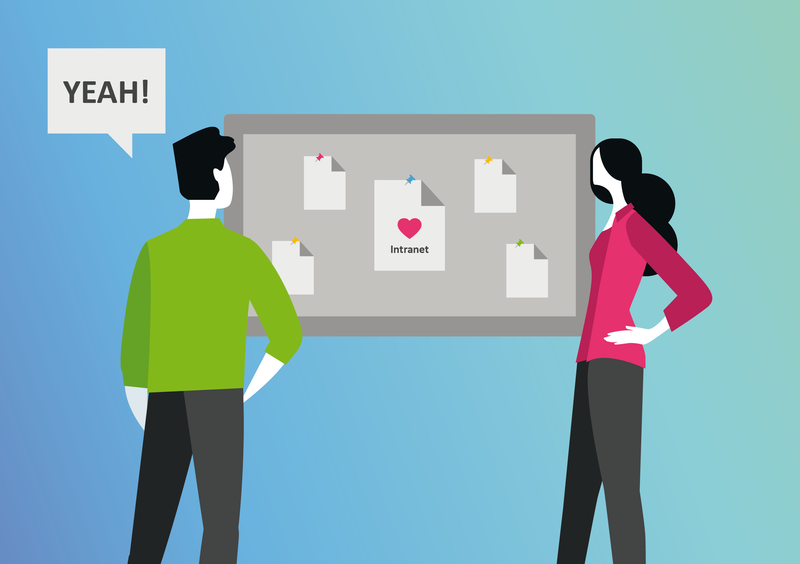 In the "Community Space," users can do everything that they couldn't do with Bernd the Board. They can add images and photos to their texts and add links to additional information. Others can comment to give direct feedback and discuss topics too. Bernd must admit, such a simple old notice board as himself can't compete with that. And in the intranet, everyone can read the posts – across the whole company. That way, they reach a lot more people than they would with a paper notice pinned on Bernd or one of his fellow boards (especially those stuck behind glass) around the company's hallways and common rooms. And those who aren't interested can simply unsubscribe from the Community Space topics and only subscribe to topics that are important and relevant to them. Bernd the Board now has plenty of time to think. What's going to happen to him now? Does this all mean that paper is dead and forgotten in his company? He doesn't think so. The day will come when someone will hang a new notice on Bernd the Board. He knows that paper still has certain advantages in its physical form and often attracts more attention. So he's not really worried that one day they'll take him down and put him away in some stuffy storage room. People have just become more aware of the higher costs associated with printing out information to hang it up on a board. There are fewer reasons to do so now. But maybe there are still some use cases there. Bernd just needs to be patient. But there's a time for everything. Are you interested in modern social intranet solutions? The Linchpin intranet suite based on Atlassian Confluence is an all-around customizable, central hub for communication and collaboration in companies which require the traditional management capabilities offered by intranet software, but on the other want to give their teams the tools they need for modern digital collaboration. We'd love to chat with you about your needs and show you what Linchpin can offer you. Get in touch with us today!